How can Marana preserve and enhance its existing qualities while reaching its fullest potential as a community? That’s one of many questions to be explored as part of the process of updating Marana’s General Plan (Learn more about the Marana 2040 General Plan). 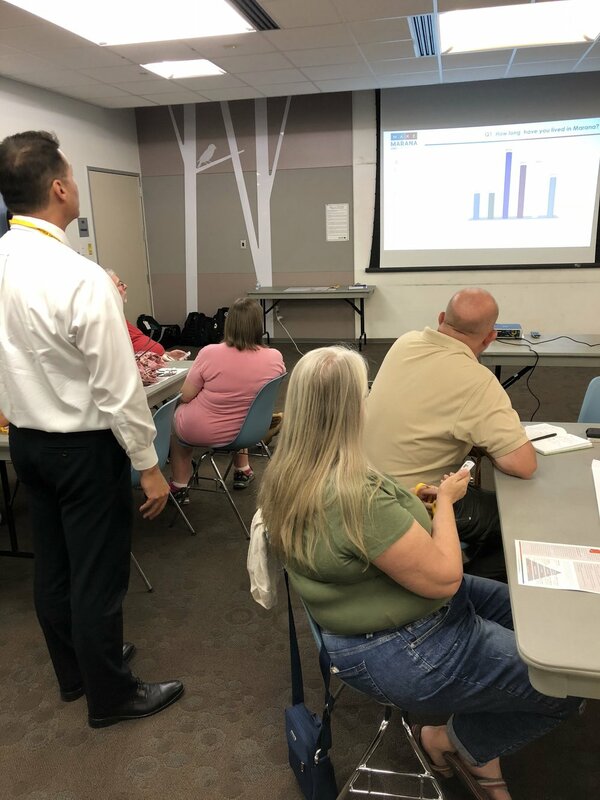 Town of Marana hosted the first Marana 2040 General Plan public workshops on Wednesday, October 3 and October 4 to solicit feedback from community members on their vision for Marana’s future. Locate key assets and challenges geographically that make Marana unique. A total of 43 people attended the two workshops. Upon arriving, each attendee was asked to sign-in by providing their name and email to be added to the project eBlast list for future project notifications and updates. 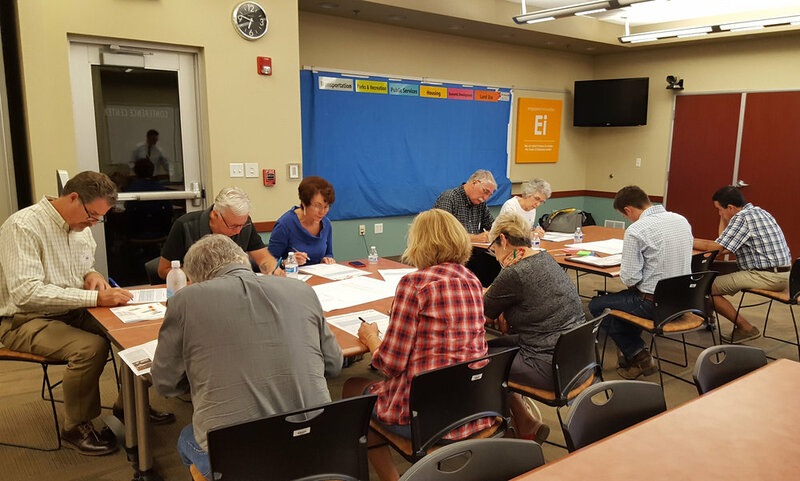 The attendees were also asked to identify on a map, generally, where they live or work in Marana to see what areas of the Town are being represented in the workshop results. Attendees at the October 3rd workshop used red dots, and are dispersed across the Town of Marana, between Gladden Farms, Dove Mountain, and Continental Ranch. Attendees at the October 4th workshop used blue dots, and are mostly north of Tangerine Road and west of Interstate 10, with some dispersed along the eastern edge of the Town. The workshop began with a presentation featuring a broad overview of what a General Plan is and the update process, and included four exercises to gather community input that will help guide the General Plan update. These exercises and the results are described and summarized on the following pages. A series of 20 survey questions regarding various topics related to the Town of Marana were asked throughout the presentation. Participants were able to provide their responses using an electronic polling device. Below are highlights from the survey results. Most participants (25%) have lived in Marana for less than one year, and 44% live in the northwest portion of Marana, which is north of Avra Valley Road and west of Interstate 10. A majority of participants (59%) are not familiar with the current 2010 Marana General Plan. Over 90% of respondents rated Marana’s housing quality as average or better. Most participants, 32% rated the diversity of housing in Marana to be above average, but also identified a wide spectrum of housing they would support, of which mixed-use housing received the most votes with 22%. Marana’s recreation and open space system was highly rated, with 85% of participants rating Marana’s overall park facilities average or better and 90% of participants rating the quality of trails and pathways as average or better. Retail shopping in Marana is viewed as roughly average in Marana, with 42% of respondents rating it as such, but 45% of respondents rated dining and entertainment as below average. The top 3 things participants think need to be improved are dining (25%), jobs (19%), and shopping (17%). 61% of respondents would like to see the Town grow more in the northeast portion of Marana, which is north of Avra Valley Road and west of Interstate 10. Respondents identified Marana’s best asset for the future as opportunities for growth and business development (24%), and the biggest threat to Marana’s future as a lack of jobs (28%). View the workshop survey results. 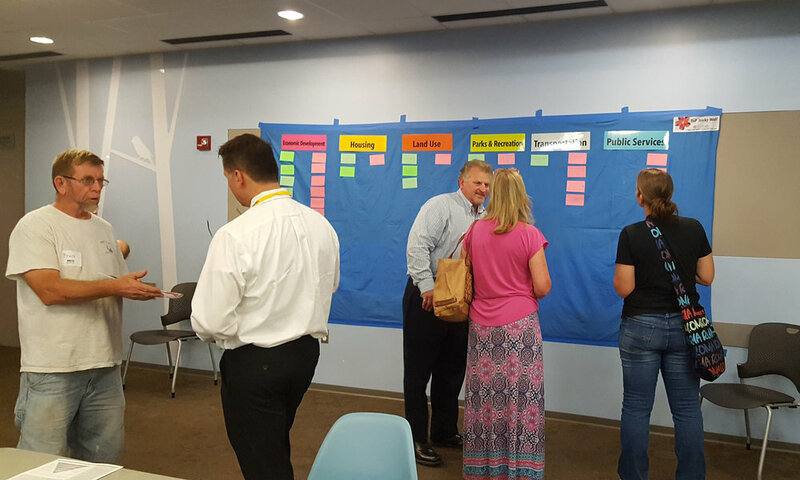 The second exercise involved developing a Vision Statement for the Marana 2040 General Plan. A Vision Statement reflects what community members value the most about their community and the shared aspirations for their community. The Vision Statement should be inspirational and set the tone for the General Plan’s goals and policies. The purpose of the Visioning Exercise was to develop a Vision Statement to guide the General Plan and the future of the Town. During this exercise, participants were asked to individually create a Vision Statement using a worksheet that had two ‘fill-in-the-blank’ options, and one “Create Your Own” Vision Statement option. The participants were given a series of values, assets, adjectives to complete this exercise, but were also able to come up with their own words. Once completed, the participants formed small groups to write one vision statement that best reflected their ideas about Marana’s future. Marana promotes a/an [adjective] quality of life that is built on [values] , , and . We pride ourselves with having [assets] , , and that respond to our diverse needs. The Town will grow in a manner that ensures that new growth and development improves our community and retains our shared values. Marana in 2040 is recognized as a/an [adjective] , , and place to live, work and play. Our community, with its [assets] , , and provides [future assets] , , and and is a preferred regional and national destination. The following provides the results from each of the small groups. For the fill-in-the-blank options, words filled in by the groups are shown in ALL CAPS. Marana promotes a VIBRANT quality of life that is built on COMMUNITY SPIRIT, STRONG FAMILY, and SENSE OF HERITAGE & TRADITION. We pride ourselves with having A DOWNTOWN, OPEN SPACE, and QUALITY NEIGHBORHOODS & SCHOOLS that respond to our diverse needs. The Town will grow in a manner that ensures that new growth and development improves our community and retains our shared values. Marana promotes a VIBRANT quality of life that is built on SUSTAINABILITY, INTEGRITY, and INCLUSIVENESS. We pride ourselves with having QUALITY NEIGHBORHOODS, ENTERTAINMENT, and JOBS that respond to our diverse needs. The Town will grow in a manner that ensures that new growth and development improves our community and retains our shared values. Marana promotes an ACTIVE quality of life that is built on STEWARDSHIP. We pride ourselves with having OPEN SPACE, and NIGHT-TIME SKIES that respond to our diverse needs. The Town will grow in a manner that ensures that new growth and development improves our community and retains our shared values. Marana promotes a FAMILY-ORIENTATED quality of life that is built on SENSE OF COMMUNITY, COLLABORATION, and SUSTAINABILITY. We pride ourselves with having HOUSING, QUALITY NEIGHBORHOODS, and SCHOOLS that respond to our diverse needs. The Town will grow in a manner that ensures that new growth and development improves our community and retains our shared values. Marana in 2040 is recognized as an ATTRACTIVE, UNIQUE, and VIBRANT place to live, work and play. Our community, with its JOBS, ENTERTAINMENT, and CULTURAL RESOURCES provides COMMUNITY SPIRIT, SECURITY, and SENSE OF HERITAGE & TRADITIONS, and is a preferred regional and national destination. Marana promotes an UNIQUE quality of life that is built on COMMUNITY SPIRIT, INCLUSIVENESS, and UNITY. We pride ourselves with having OPEN SPACES, VIEWS, and TOWN SERVICES that respond to our diverse needs. The Town will grow in a manner that ensures that new growth and development improves our community and retains our shared values. Marana in 2040 is recognized as an ENGAGING, CONNECTED, and INNOVATIVE place to live, work and play. Our community, with its NATURAL RESOURCES, HOUSING, and NIGHT-TIME SKIES provides JOBS, ENTERTAINMENT, and QUALITY NEIGHBORHOODS, and is a preferred regional and national destination. Marana promotes an ENGAGED CONSCIENTIOUS quality of life that is built on STEWARDSHIP, SUSTAINABILITY, and SENSE OF COMMUNITY. The Town will grow in a manner that ensures that new growth and development improves our community and retains our shared values. The third exercise allowed participants to brainstorm specific issues and opportunities they feel are important to address in the General Plan Update process. In this exercise, participants were asked to write issues on pink index cards and opportunities on green index cards. The issues and opportunities were then sorted into one of six categories: Economic Development, Housing, Land Use, Parks & Recreation, Transportation, and Public Services and posted on a board for viewing. The last exercise was a Mapping Exercise where participants were given a set of red, green, and yellow stickers and were asked to identify positive assets in Marana with a green sticker, areas that need to be improved with a red sticker, and a defining characteristic of Marana with a yellow sticker on a map of the Town. The stickers were then numbered with corresponding notes as to what they are referring to.